On a scale of 1-10, with 10 being the highest, how would you rate your use of Salesforce? Are there features or functionality that you wish you understood better? Whether you are in Sales, Marketing, Customer Service, IT, Management, or really any role in your organization, it is important to continually enhance your knowledge of Salesforce to get the greatest return on investment. With the launch of trailhead, it’s never been easier to learn more about the features that Salesforce offers, but how about getting your burning questions answered – and seeing what questions other users have? 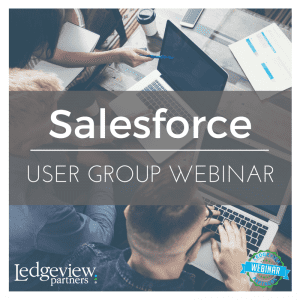 Join Ledgeview Partners on Wednesday, September 13th for our complimentary Salesforce User Group Webinar as we provide training tips and answer user submitted questions. This month our Salesforce Experts will focus on tips and best practices for connecting your emails to Salesforce, but will answer any Salesforce questions you submit on any salesforce functionality. You do not need to be a customer of Ledgeview Partners to attend in this webinar. If you cannot attend the live session, simply register, and we will send you an email after the live session to access this webcast on-demand.